I don’t mean to ruin your summer now that it is (unofficially) underway, but did you know that you might get stuck on a roller coaster? It’s always happening. It happened most recently (as of the posting of this post—who knows how many times it’s happened since?) Monday at the Cedar Point amusement park in Sandusky, Ohio, the legendary hometown of Danielle from 90 Day Fiancé. 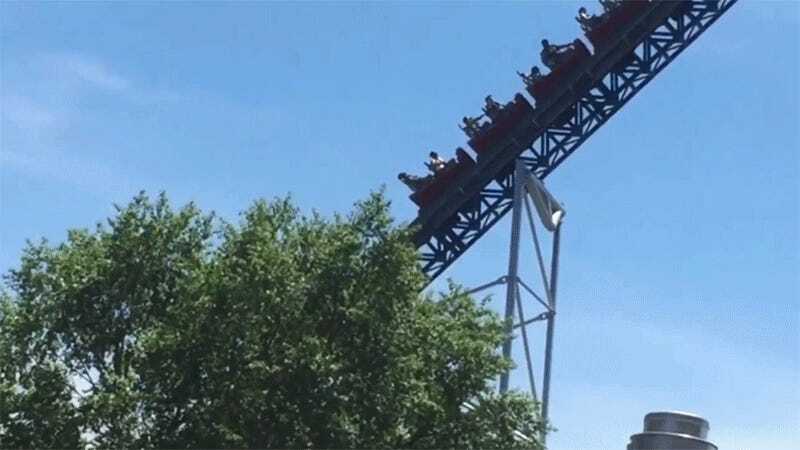 A portion of the park’s power was out from 1:45 to 3:50 p.m., according to a statement a Cedar Point spokesperson gave to The Blade, causing some riders to be temporarily stuck. You’d think there’d be some sort of backup generator given that riders are putting their lives in the steel hands of these coasters, but I guess the threat of this happening is one of the ride’s many thrills. There are its multiple hills. There is its overbanked turn. There is the 360-degree right-handed helix. There is the notion that you might lurch to a stop and find yourself suspended hundreds of feet in the air pointed directly at the blazing sun. Exciting! At least these people were upright and reclining. Earlier this month, riders of the Flying Dinosaur ride at Universal Studios in Japan were stuck upside down for two hours. Inside Edition claimed that no injuries were reported, but what about the trauma? I’m nauseated just thinking about this. Below is a compilation of more people getting stuck on giant rides. Enjoy your summer.